Matt Drudge, without being a politician, is probably one of the most powerful political forces in America. His Drudge Report has been a cornerstone of independent news media for over a decade. It continues to grow in audience and influence at the expense of the government-lapdog "mainstream" media and is at least partly responsible for today's libertarian and paleo-conservative resurgence. Astrology gives us some insight into the conservative media king. Pallas/Ethics: There are hints at openness to authoritarianism: Pallas is quindecile Pluto and ruled by Mars which is widely conjunct Pluto. These tendencies are most likely overridden by Pallas quincunx the Sun and novile to the North Node, which is also widely trine Pallas' ruler Mars. This configuration explains his migration from a more-or-less mainstream conservative to more-or-less libertarian. Venus/Economics: Venus is quindecile the North Node, which is trine both of Venus' rulers Mars and Pluto. That Venus is also conjunct the Sun probably amplifies this factor. Drudge is something of an anomaly in modern American political life: a true fiscal conservative. Moon/Culture: Without a time of birth, we can't be completely certain which way the chart swings. The Moon is possibly quincunx either Neptune or the South Node, for a possible culturally liberal vector. In any case the Moon is (almost) definitely in Aries, ruled by Mars which is widely trine the North Node, providing a culturally conservative vector. This may account for anti-abortion views. The overall picture from these three factors suggests a dedicated fiscal (and probably cultural) conservative who becomes more libertarian over time. The extremely Leftward-biased mainstream-media coverage of this season's "government shutdown" is a timely reminder of why Drudge remains relevant, crucial, and growing more so. 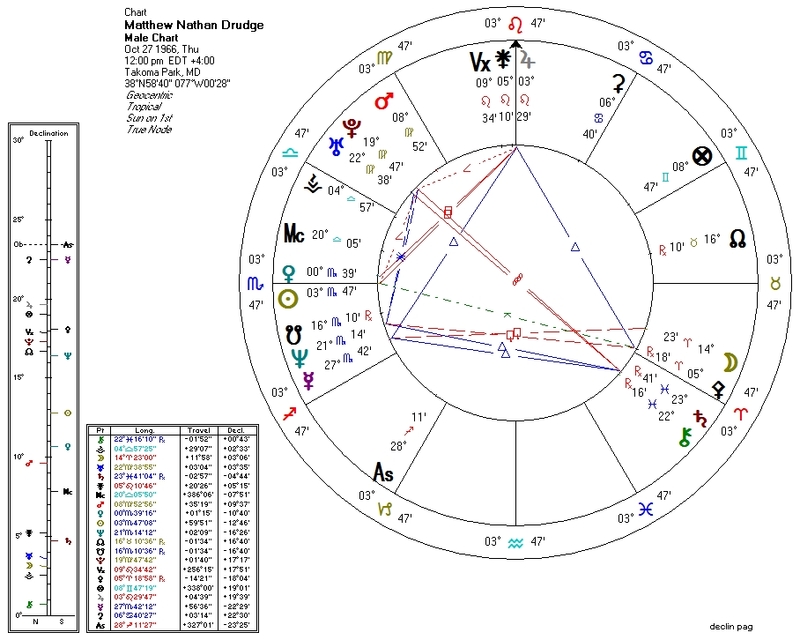 Neptune conjunct South Node and trine Saturn: As Neptune is a primary indicator for Leftist leanings, it is appropriate that Neptune is restricted and weakened by these aspects. The combination of these three factors often appears in the charts of outspoken atheists. Saturn opposite Pluto: An aspect that Richard Tarnas associates with rises in conservatism. Sun/Jupiter/Pallas triangle: Pallas/Jupiter aspects often appear in the charts of skillful publicists and teachers. That these two bodies are in close aspect to the Sun suggests that the related skills are part of Drudge's reason for being. Mercury/Jupiter/Saturn grand trine (wide): Communication (Mercury) regarding public life (Jupiter) and authority (Saturn).